General considerations: The age, weight, condition, and type of disease present will affect the dosage of herbal medication prescribed. Lower doses are typically given to puppies, kittens, weak, chronically ill, and geriatric animals. Larger animals may require a larger dose, and some animals are naturally more sensitive and may require a lower dose. In general, begin with the lowest recommended dose and then adjust it up or down depending on the response of the animal. Herbal medication is typically administered to dogs and cats twice a day, in the morning and evening. Dogs are given herbs mixed in with food, or given in a special treat. Cats usually will not tolerate herbs mixed in their food and will refuse to eat. However, mixing the herbs with food that cats particularly like should still be tried initially to try and achieve long-term herbal administration. Because it can be difficult to regularly administer medication of any kind to cats, it is best to give them extra-concentrated herbal formulas whenever possible. Depending on the condition, once daily administration, while not ideal, may still have beneficial effects. An herbal formula may be given more than twice daily, especially in serious cases. It is recommended that the animal's condition be periodically monitored by the veterinarian when more than one herbal formula is prescribed for your pet. Give only one formula for several days to see how well the animal tolerates it, then add in the next formula. In some cases, it will be necessary to give an herbal formula for an extended period of time. Geriatric animals or those with constitutional weaknesses or chronic illness may require support for months and sometimes years. Treatment for acute conditions or for young, fit animals are given until the condition has resolved, and then stopped. treatment for chronic diseases can be continued at a lower dose, or the dose tapered over time depending on the condition being treated. Some herbal formulas in pill form may be crushed to a powder for topical application. Hair may need to be clipped or shaved in some cases, especially to apply medicinal plasters. Herbal medications typically take longer than Western pharmaceuticals to produce a clinical response. Usually, a positive response can be seen within 3-14 days, providing the correct Chinese medicine diagnosis has been made and the appropriate herbal formula selected. If a positive response is not seen during this time, the dose of herbs may need to be increased or a different herbal medication may be needed. There are owners who may decide to give their pet a reduced dose, perhaps because of cost, convenience, difficulty in administration, or some other factor. It is important for owners to know that in order to achieve a good therapeutic response, herbal medications must be given at the recommended dose for the appropriate length of time, the same as with the administration of Western pharmaceutical drugs. It is recommended for the veterinarian to periodically monitor the animal's condition, utilizing both Western diagnostics and Chinese veterinary medical examination (tongue and pulse diagnosis) to determine if the formula they are being given is effective and still appropriate. In general, for acute conditions, an animal may need to be rechecked once every 3-7 days; for chronic cases, once a month may be adequate. Chinese herbs have a long history of safety and efficacy. The most common side-effects seen in veterinary practice are vomiting and/or diarrhea. These effects typically resolve within 24 hours of stopping the herbal medication. If this occurs, the herb dose should be decreased by one half and given again. If vomiting or diarrhea persist, discontinue the formula and call your veterinarian. Before prescribing more than one herbal formula, it is important to be certain the the herbal medicines are compatible to avoid adverse herb-to-herb interactions. No additional herbal medications should be given to your pet without informing your veterinarian. The same is true for giving additional Western medications. It is important to note that cats can be sensitive to the effects of some herbal medications and exceeding the recommended dose is not advised. It is not advised to give cats herbal tinctures made with alcohol without first boiling off the alcohol. The alcohol in the tincture typically causes foaming and excessive salivation. Tinctures prepared with glycerin are a good alternative. Chinese herbal medications should be discontinued 5-7 days before and 5-7 days after anesthesia and surgery of any kind. In general, herbal therapy can resume 5-7 days post-operatively. This recommendation is made because many of the interactions between Chinese herbal medications, Western drugs, and anesthetic agents are still unknown, and so it would seem prudent to make this recommendation until further information is available. According to a recent survey by the Journal of American Medical Association, 18.4% (approximately 15 million) of all prescription drug users in the US have taken herbal and prescription medications together. A parallel trend is being seen in veterinary medicine today. With this in mind, it is important to carefully evaluate all drugs, supplements, etc., an animal may have already been taking to assess the potential for adverse interactions before prescribing herbal medications. As research on the interactions of herbal medications and pharmaceutical drugs emerges, informational guidelines will become available to practitioners of Western and Chinese medicine to safely and effectively maintain the health of animals and people when prescribing both types of medications. In general, when Chinese herbal therapy is combined with pharmaceutical drugs in veterinary medicine, the dose of the pharmaceutical drug is typically decreased if possible. This is because many drugs can cause side-effects when used long-term as a single therapeutic agent. Most pet owners who seek out a Chinese medical approach want to avoid or decrease the long-term side-effects of pharmaceutical drugs, enhance or improve therapeutic effects, and improve the quality of life for their animals. 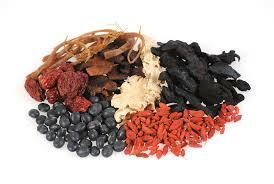 Many Chinese herbs have been determined to be as effective as potent biological response modifiers. Biological response modifiers (also known as immunotherapy), enhance the activity of the immune system to increase the body's natural defense mechanisms against cancer. Chinese herbs can work synergistically with chemotherapy and radiotherapy treatments to prevent recurrence of malignancies, stop metastasis, prolong remission and survival times, and decrease the adverse effects (anorexia, anemia, low white blood cell counts) of many anti-cancer drugs. Chinese herbs can be used alone to treat cancer as a primary therapy in cases where chemotherapy or radiation therapy would be too toxic to the animal due to age and condition. Chinese herbs are safe with little to no incidence of side-effects when prescribed by a qualified herbalist. They can also be used in combination with mistletoe injectable therapy and IV Vitamin C therapy to improve clinical results. Chinese herbs can be used to treat many diseases recognized and treatable by conventional medicine and many that are not. Chinese herbs can be used as part of an integrative approach with other systems of medicine for a greater therapeutic effect and improved treatment outcomes. Chinese herbs can be used to strengthen the body after illness, injury, chemotherapy, or radiation. Chinese herbs are especially useful in the treatment of chronic disease conditions and those associated with aging such as chronic osteoarthritis, immune, renal, and hepatic disorders. Chinese herbs can also be used to strengthen and support the immune system to help prevent disease before it occurs. Chinese herbs can be used when there are drug sensitivities or conditions that would prevent the use of other types of therapies. Where do herbal medications come from? Most herbal medications are obtained from China, Taiwan, and from companies which grow herbs in the U.S. They are tested for quality and purity and are from the same companies that sell herbs used to treat people. No products from endangered species are used in these herbal formulas. 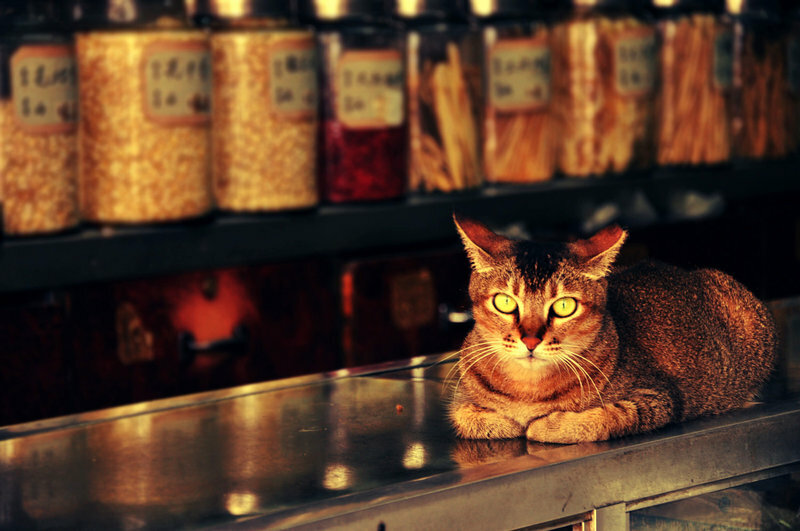 A veterinarian who is trained in Chinese herbal medicine is familiar with companies that are reliable and trustworthy, and will obtain herbal formulas from such companies. It is not recommended that you purchase from alternative sources. Do herbal medications have side effects? Chinese herbs are safe and effective when prescribed by a trained, experienced Chinese herbologist, especially when compared to conventional medications. Side-effects are usually seen in the form of mild vomiting and diarrhea, which stop after the medication has been discontinued. There are some herbal medications that can invigorate blood circulation, and because of this, property must be discontinued prior to any surgical procedures, as they may cause an increase in bleeding. How often do herbs have to be given? Herbal prescriptions must be given consistently 2-3 times daily, the same as conventional medications in order to obtain a therapeutic response. How do I give my pet herbal medications? The same way as with conventional medications. Herbal powders are usually mixed into food and taken 2-3 times daily. Pills and tablets are given with a food treat for easy administration. How long does it take to see a response from herbal medications? This depends on the animal and the condition being treated. The average time is 3-14 days. The length of herbal treatment for chronic conditions is difficult to predict. It depends on the animal's disease, other medications they may be taking and how long their condition has been present. Why is the herbal medication changed even when my pet seems to be doing well on the current prescription? This is because over time, your pet's condition and his or her response to the herbal medication changes. The herbal must be re-formulated to take these changes into account in order to maintain or resolve your pet's problem.